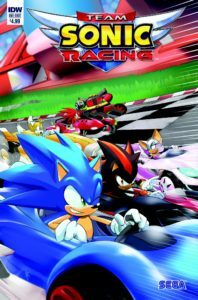 Team Sonic Racing will be getting a prequel comic from IDW this October. Revealed at IDW and SEGA’s “Way Past Cool Sonic Panel” at San Diego Comic Con, the comic will feature Sonic and his friends “facing an old foe” while racing across an alien planet. The $5 price seems a little much if this is like a regular 20-page comic. I’m hoping this is at least a double sized issue. I’m also really glad Ian isn’t writing this. I’m pretty sure this is going to be a double sized comic. These days regular size (About 24 – 32 Pages) tend to be 2.99/3.99 while double sized (About 48 – 52 Pages) tend to be 4.99/5.99. $5 is outrageous for just a single issue if it’s only the stanfard page count.